Back in March, we received a postcard in the mail from the Lego Club (The "Pickles" are both members). 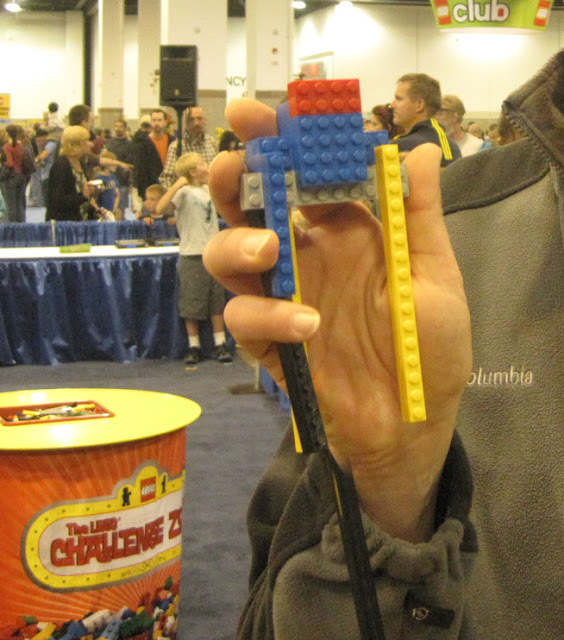 The postcard was an announcement about the Lego KidsFest coming to the Colorado Convention Center in Denver. Well...we KNEW we had to go! Weren't we a family that LOVES Lego's? As soon as I knew which day of the KidsFest we had clear, bought our tickets. Then we waited for the day of the KidsFest...sometimes patiently, sometimes not...for an entire month! The week of the KidsFest, all the "Pickles" could talk about were Lego's. The Boy just KNEW he wouldn't be able to sleep the night before. When the day finally came, he kept asking how much longer it would be before we left (there were two "sessions" that day and we had the later one). We just couldn't get there fast enough for him. At least he paused long enough to get a photo with the enormous blue bear outside the Colorado Convention Center. I think maybe the bear wanted to play with Legos, too. I was hoping the KidsFest would be all he was expecting and more. Well...three acres...all Legos. What do you think? They both LOVED IT! There was so much stuff to do that they didn't even get to HALF of it! Right at the entrance were lots of Lego statues. The detail on the statues was just incredible - specially considering these are all created from the regular 2x6 bricks! and then race them down ramps against other kids. (I hope I never see anything resembling THIS pile of Legos in my home). I pulled the kids out of the brick pile and dragged everyone over to the "Lego Challenge Zone" where they had 2 minutes to create whatever the announcer chose. When their turn came, they had two minutes to make a shark or an octopus. The "Pickles" teamed up to create a shark. "Creation Nation" was next. A huge map of the US was taped out on the floor (including Alaska and Hawaii). Everyone could get a square baseboard and create on it whatever they wanted. They could then tell the staff members where in the US to place their creation. Some of the creations were really impressive! There were THREE Statues of Liberty. We had signed up for one of the "Master Builder Academy" workshops but still had some time before it started. The "Pickles" both moved over to the "Lego Art Gallery" where they could create mosaic tiles for display. Once The Boy finished his, he headed over to the Ninjago area to play while The Girl started a second mosaic. Finally it was time for our last event, the Master Builder Academy workshop (I was looking around for a chair by then and thankfully found one in the workshop area.) Master Builder Steve worked for Lego designing sculptures - not the kits you can buy in the store. He even had a college degree in sculpture. He talked with the kids about building STRONG models (as opposed to just cool looking ones). As they built their spaceships and robots and whatever else they were creating, Steve went around for some one-on-one time with (almost) each child. He commented on their techniques, suggesting ways to make their models stronger. With the Master Builder Academy over (it was about 30 minutes long), there was time for one last game of Ninjago before it was time to go. The "Pickles" got a Duplo KidsFest Brick as a souvenir as we walked out of the building. They also started making a game plan for the "next time". I guess they enjoyed it. The entire KidsFest was broken up into 5 "sessions". One Friday evening and 2 each on Saturday and Sunday. The Friday morning news announced the Saturday morning session was sold out. By Friday evening, all of the Saturday and Sunday sessions were sold out. So if you want to go, don't wait until the last minute to get your tickets! We had never been to the Colorado Convention Center before so we had to find our way there. It was pretty convenient to I-25. I was surprised by the life in downtown Denver on a Saturday afternoon. I guess coming from Winston-Salem, NC (which is VERY small in comparison) I'm still used to a downtown area being fairly empty on weekends, but Denver was really REALLY busy. Once we found our way to the parking deck (right behind the Colorado Convention Center), parking wasn't a problem. There were plenty of spaces available. We needed to remember our parking space number so we could pre-pay for parking. You could use cash or cards at any of the machines located in the parking deck (we were directed straight to the top deck). Just enter in your parking space number and select how long you plan to use the parking space (It was $12 for up to 8 hours. We only needed 4 hours but still had to pay for 8. Use this link if you need to see rates). If you use cash, this machine WILL dispense dollar coins. If you don't like that, try to use exact change. I wound up with 8 dollar coins. There were concessions stands open in the event area so food and beverages were available. Wear something COMFORTABLE! You will be standing a lot at the tables creating stuff. There are a lot of chairs in the Lego Theater area, but not a lot of chairs at each of the activities. Your best bet is to do the activities with your kids to help your body avoid the need to SIT DOWN. Don't worry, you won't look crazy digging into the Legos yourself. Most of us parents used to play with Lego as kids anyway. You don't ever really grow out of it. Our session was sold out and there were a LOT of people. That being said, lines moved quickly but tables were crowded. Everyone was in a good mood, though and the crowding wasn't a problem. There was a "lost parent zone" right at the entrance so it was easy to show the "Pickles" where they needed to go if they discovered that "Mama and Daddy were lost". You CAN NOT take Legos home with you unless you bought them at the on site Lego Store. Yes, there was a Lego Store right in the middle of the event - pretty convenient for people who might have come to the event from cities and towns that don't yet have a Lego Store.